SR0907 - DARIO MAZZUCCO 4TET: "LIGHT LUNCH"
Dario Mazzucco (drums), Stacy Dillard (tenor sax), Lucio Ferrara (guitars), Ryan Berg (double bass), Guest: Antonio Ciacca (piano). An italo-american quartet, sometimes enriched by a special guest: pianist Antonio Ciacca, important musician of the New York scene. 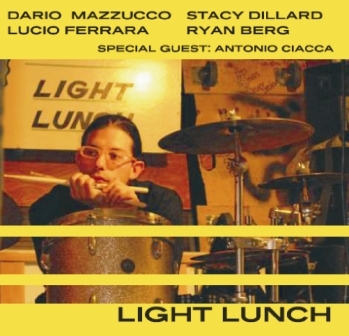 The snardads here performed perfectly fit in the program of original compositions by Dario Mazzucco; this is a clearly Jazz-style, fluent and amazing. It shows how this form of improvisation is always able to bring emotions, yesterday like today.